Pressure washer pumps can be burned out in many ways. It's more common than you might imagine. Whether you left the pump running with no pressure relief, it cracked in storage during the off-season, or perhaps it's just suffered from wear and tear, pressure wash pumps burn out and break from time to time. 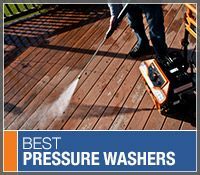 However, there's no need to throw out your pressure washer and buy a new one. Instead, just replace your pressure washer pump. Repairing power equipment can be hazardous. Always utilize the proper tools, and follow all safety precautions outlined in this guide and in your manufacturer-provided owner's manual. The information contained in this guide is intended only to be an informative outline of the process of changing out your pressure washer pump, and should not be treated as a substitute for the information provided in the owner's manual you received with your pressure washer. 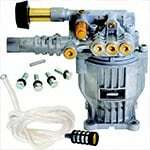 Before beginning the removal and replacement of your pressure washer pump, read your pressure washer owner's manual and any documentation received with the replacement pump in their entirety. Always exercise caution when working around power equipment, and be sure that the pressure washer is disconnected from any power source, or that the spark plug is removed, prior to beginning the process of replacing your pressure washer pump. 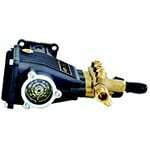 Before you can replace your pressure washer pump, you need to make sure you've chosen the correct replacement. Your new pump must be compatible with your pressure washer. You can't replace with any pump you wish, because they just won't fit. Determine if your pressure washer uses an axial or triplex pump. Axial cam pumps are less expensive and produce enough PSI to tackle most homeowner jobs, but they don't last as long. This is because axial cam pumps are connected directly to the pressure washer's engine, which means they run at the same speed as the engine. Triplex pumps are more robust and resilient. They use three pistons and plungers to create higher PSI than axial cam pumps, and they utilize higher quality components and bearings, so they last much longer. If your pressure washer was a lower-cost model designed for homeowner use, you likely have an axial cam pump. If you have a professional grade power washer, you've likely got a triplex pump. In addition to the kind of pump, you need to make sure to choose the right GPM and PSI. Gallons per minute (GPM) is the amount of water the pump moves per minute, and should remain compatible with your previous pump. Pounds per square inch (PSI) is the amount of pressure produced by the pump, and should also be compatible. Replacing a pump with too much PSI or GPM can damage other components of your pressure washer and may even be dangerous. Before you can fully remove the old pump from your pressure washer, you'll have to make sure all components are disconnected from it. The first thing you should do is disconnect the spark plug wire. Simply pull the wire from the spark plug to disconnect it. There shouldn't be any special tools needed for this. Next, you'll have to disconnect any hoses that are connected to the pump. There are a few hoses that you'll need to disconnect. One is the water inlet hose, one is the outlet hose that runs to your spray nozzle, and the other is the chemical injection tube. The inlet and outlet hoses are simple. Just unscrew them from the pump. Next is the chemical injection tube. If there are chemicals or fluids in your chemical injection tube, you don't want to spill them out. Use a hand-clamp to clamp the hose flat near the point where it meets the pump. This will prevent the fluids from draining out while you switch pumps. Then simply pull to slide the hose off the pump. Now that the hoses and spark plug are disconnected, you'll be able to remove the pump from the power washer. There are typically three or four bolts and nuts used to hold the pump on the unit. The bolts are often times Allen head bolts, so you'll need to use an Allen head bit with a ratchet to loosen the bolts. However, if you simply turn these bolts, they'll keep turning and never come loose. Hold the nut in place on the opposite side with a standard wrench while you loosen the Allen-head mounting bolts. Do not fully remove them yet. Once your Allen bolts are loose, support the pump with one hand while you remove the bolts with the other. This will prevent the pump from freely falling to the ground. Now that the bolts are removed, your pump may easily slide down off of the crankshaft, but if it doesn't, you may have to pull a little to work it loose. Before installing the new pump, you'll want to check for a thermal relief valve. Thermal relief valves protect the pressure washer and you by releasing hot water when the internal pressurized water exceeds safe temperatures. As water recirculates through the pump, typically when the washer's running but not being used, its temperature increases. If the temperature reaches 145-degrees or above, it can damage the seals on the unit, causing the pump to overheat. This can cause further damage to your pressure washer and possible injury to the user. 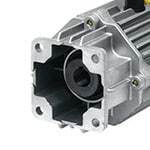 If your new pump does not have a thermal relief valve, you need to transfer the one from your old pump to your new pump. 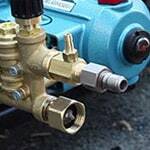 If the old valve is damaged, you should invest in a new one and install it prior to using the new pump. Now that your old pump has been removed and the thermal relief valve installed on the new pump, you can mount your new pump to the pressure washer frame. This will be quite simple since you've already removed the old one. It's just the opposite of what you did before. If you haven't already, clean the area where your old pump was previously mounted. There may be build-up and dirt around the mounting area. Use some rubbing alcohol to scrub away any hard-to-remove residue. Hold your pump in place with one hand, then place the bolts in with the other and secure the nuts on the opposite side. Tighten them by hand to help hold it in place, then use your wrench and ratchet to tighten the pump securely to the frame. Once your pump is in place, you can reconnect the tubes and the spark plug. Firmly press the chemical injection tube into place and remove the clamp. 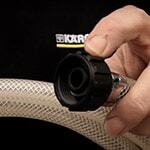 Reconnect the inlet and outlet hoses tightly. If you've had any leaking issues in the past, now is a good time to apply some pipe thread sealing tape to help seal the connections so they don't leak. Reconnect the spark plug wire, and you're ready to go. Be sure to test it out and make sure everything's working correctly. Adjustments may be necessary. If you're yet to invest in a new pump, check our link below and find the perfect replacement pump today.